Build a city from the ashes of a fallen civilization, and rule your people with wisdom and justice in Heroes of Hellas 2: Olympia! 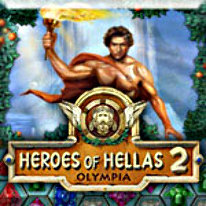 Heroes of Hellas 2 challenges you to drag your mouse across chains of identical items to remove obstacles, activate bonus items and collect valuable objects. Between levels, you can play one of eight mini-games and spend the gold you earn on upgrades for your city!